I was Born in Warwickshire England and lived there till my teens. The beauty of the countryside shaped my life from as early as I can remember. The culture, steeped in tradition and history I miss to this day. I then moved with my family to a beautiful little Island called Guernsey which is part of the English Channel Islands. 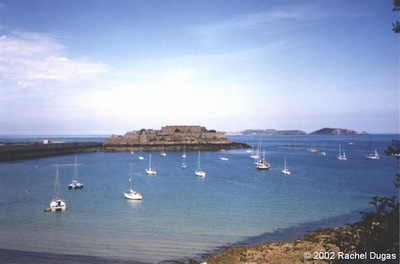 This is a very small Island, 7 by 31/2 miles, nestled in the Bay of St. Malo along with its sister Islands Jersey, Alderney, Sark and the little paradise island called Herm. It is 85 miles south of England and within sight of France and its main town is St. Peter Port. "Little jewels dropped by France and picked up by England". Castle Cornet, St. Peter Port, Guernsey. Guernsey is very picturesque and full of colour. Its mild climate is similar to that of central California, the temperatures rarely dropping below freezing. The beaches are some of the cleanest in Britain with beautiful clear blue water, long stretches of sand on one side and steep rocky cliffs on the other. It is the perfect place for long walks along the cliffs, for bird watching, nature study, boating, sailing & water sports, artists (Such as Renoir) and for writers and poets (Guernsey was home to Victor Hugo and his home "Hauteville House" holds many of his works including "Toilers of the Sea" and "Les Miserables"). The pace of life in Guernsey is slow yet it is close enough to England and just a puddle hop away from the rest of Europe. The old language of Guernsey is "Guernésiais" (Dgèrnésiais), also known as Patois, Guernsey French or Normandy French & is still in use today among older residents. Street names, houses and parishes are named in French also. 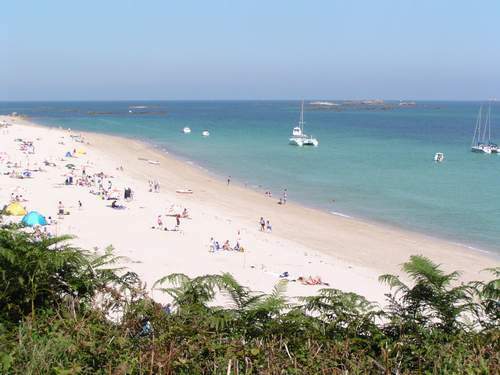 The photo above is of Shell Beach in Herm. Click the link at the bottom of this page to see a few more Guernsey photos. Although always an island girl at heart, I have lived in Texas now for 20+ years. My interest in nature continued as I began to learn about the different animal and plant life here. I also volunteered a number of years at a local Nature Center as a docent. On the home front I had to rethink my way of gardening as English plants just do not grow down here in Texas! I have been able, over several years, to landscape with Texas plants, English style, and is landscaped to attract birds and wildlife. This country has so many beautiful places and my birding allows me to see many places I would not otherwise see, places off the beaten path. This is the Guernsey Anthem, the words of which couldn't mean more to me! The word "Sarnia" is the traditional latin word for "Guernsey" and the title translates as "Dear Guernsey". It was written in 1911. The music for it can be heard here. Guernsey photos - A handful of my own photos.